If you’re reading this blog post, there’s a good chance that your closet is not yet ready for the spring season. You peer into your closet knowing that it’s a mess (maybe even a hot mess!) – clothes are disorganized, shoes are scattered, and accessories are all over the place. You look at it and think to yourself, “I’ll deal with it tomorrow” (or next weekend, or whenever), but you close the door and feel bad about it. You feel bad because you don't know where to start or how to pull it all together again. I understand this because I help women that feel this way all the time, even more so during the spring season! But relax – I’ve got you! 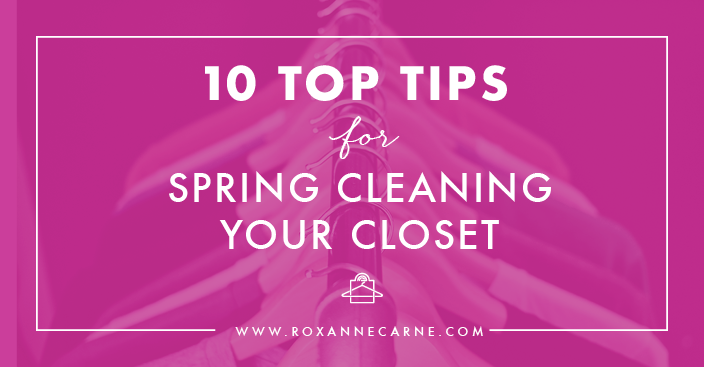 In this post, I’m going to share 10 valuable tips on how to clean and organize your closet for spring! 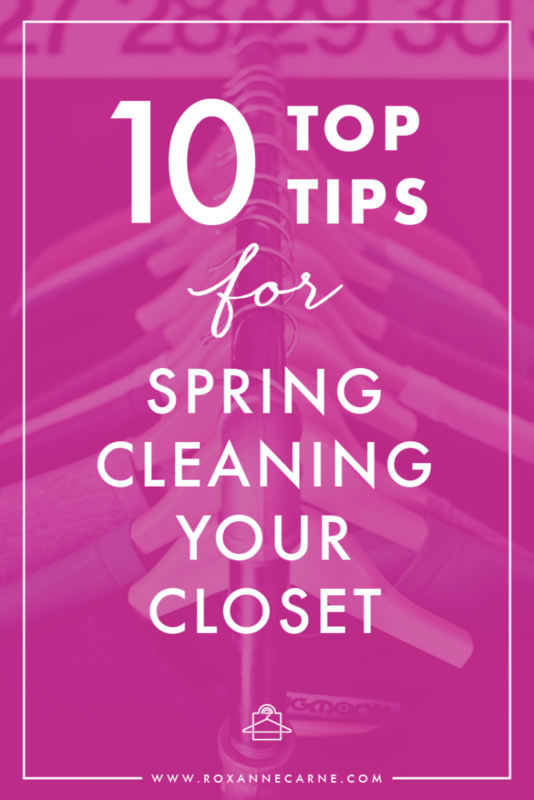 Going into this, you may feel a bit anxious but I promise you, my closet spring cleaning tips below will get you through this process easily and effectively. You will feel SO much better once you’ve got these tips under your belt. So let’s get your wardrobe in gear for the fun and warmth of the season! This is helpful because it’s almost like doing a mini Closet Edit. You can see everything that you have and make quick and necessary decisions on what you need to do with your clothes. Typically, sorting through everything may be the hardest part, but having an organization plan like this makes it much less overwhelming! Clean fall/winter clothes that are in good shape can go back into your closet or you can store them elsewhere until it's time to wear them again. Whichever choice you make is fine, but I have a strong recommendation for you. Since you won’t wear these clothes for several months, I suggest storing them in garment bags and boxes to protect them from dust and dander (even if they’re in your closet). Yes, dust can get into your closet and will accumulate on pieces that you don’t wear that often. Dusty clothes are never cool, so do yourself a favor and invest in some garment bags to help protect your investment. I recommend breathable garment bags like the example below – this is important to keep your clothes fresh. Promise that you won’t store them in plastic…you know how I feel about that! (Psst… I’ve got more tips on how to keep your clothes smelling fresh below!). For your foldable clothing items, garment boxes are a great option for long-term storage. There are so many varieties to choose from based on the amount of space you have. You can opt to store clothes in your closet, dresser/chest of drawers, or even underneath your bed! Garment boxes give you the ability to maximize your storage space. This is especially helpful if you have limited closet space. And, hey, it doesn’t hurt that it looks pretty and organized too – believe me, you’ll love having that touch of panache in your closet! When storing your clothes long-term, keeping them from smelling stale and musty is very important! One of the most effective ways to do so is to invest in nature – specifically cedar and lavender! Cedar and lavender are wonderful! Not only do they smell sooo good, but they are a natural pest repellent. That’s a win because it will keep moths away from your clothes while keeping them fresh! If you’re lucky enough to have a cedar-lined closet, bravo! If not, no worries – remember, I’ve got you. 😉 You can get cedar in all shapes and forms for your closet, drawers (they even come in drawer liners), and storage boxes. And most lavender comes in nice sachets or scented drawer liners. So let’s get back to the clothing pile you made for clothes that may have gotten damaged during the cooler seasons. You’ll look for small tears, stains, snags, and pilling. If you find any items that have these issues, you’ll need to determine if the damage is repairable. If you’re not 100% sure, you can always take it to a tailor or dry cleaner for their opinion. HOT TIP: For any clothing items that have pills (those small beady fuzzies), I have a quick and easy fix for you! I use and recommend this Conair fabric pill remover to all my clients. This battery-operated device brings your clothes back to life by gently removing pills. It has three different height settings to accommodate various types of fabric and pill sizes! This is super helpful because it extends the life of your garment – it’s a no-brainer and it’s inexpensive, too! Now ladies, I will say this…when it comes to fabric pilling, there are some garments that are beyond the point of no return. You know what I’m talking about!! LOL So let those bad boys go and just trash it. Walking around with pills on your clothing is NEVER a good look and it can get really bad really quickly. #6 – Take Your Clothes to the Cleaners! While your clothes are at the dry cleaners, this is a great time to inspect your fall/winter shoes & boots for general wear and tear, too! Depending on how much wear you’ve put on your shoes, you may need to get them cleaned up and re-soled by your local cobbler. Actually, this is the best thing to do especially with leather and suede shoes. The cobbler can apply a water repellent to your shoes which will help protect them from next season’s rain and snow. Related Article: 10 Shoe Care Tips You Need to Know! By properly caring for your shoes, you’re protecting your investment. You pay good money for quality shoes so there’s no reason why you shouldn’t pay just a little bit more to keep them up. Doing so will extend the life of your shoes for years and, in the long run, will save you money! So what about the other clothes that really didn’t see the light of day last season? You didn’t wear them for a reason – they’re too big, too small, or maybe you’re just not feeling those looks anymore! Whatever the reason, you clearly weren’t into it and that’s a signal that you should probably part with it. You can donate your gently used professional clothes, shoes, accessories to organizations such as Dress for Success. Dress for Success donates professional attire to low-income women and helps support their job-search with interview preparation and counseling. These wonderful services help women get back on their feet and secure stable employment to help support their families. And for your everyday casual clothing, I recommend donating those items to a local women’s shelter or organization that supports women in need. They’re often in need of these types of donations so this is a perfect opportunity to help someone less fortunate while trimming down your closet. With either choice, your donated clothing can make a significant difference in another woman’s life. She can get enjoyment from these clothes and they can really help her too – what’s better than that? As you clear and organize your closet for spring, one important area that you should pay special attention to is your clothes hangers. Do you have the right type of hanger and do you have enough? Remember, I always recommend using velvet slimline hangers for your wardrobe. Check out why here. Here are some great options for velvet slimline hangers and accessories that you can choose from. I absolutely love the slimline hangers from Amazon, but The Container Store has great options, too! Introduced smart storage solutions to help keep you organized and in control of what’s in your closet! And now that you have a perfectly organized closet, it’s a great time to introduce some fun, new spring clothing! Once again, I’ve got you covered! 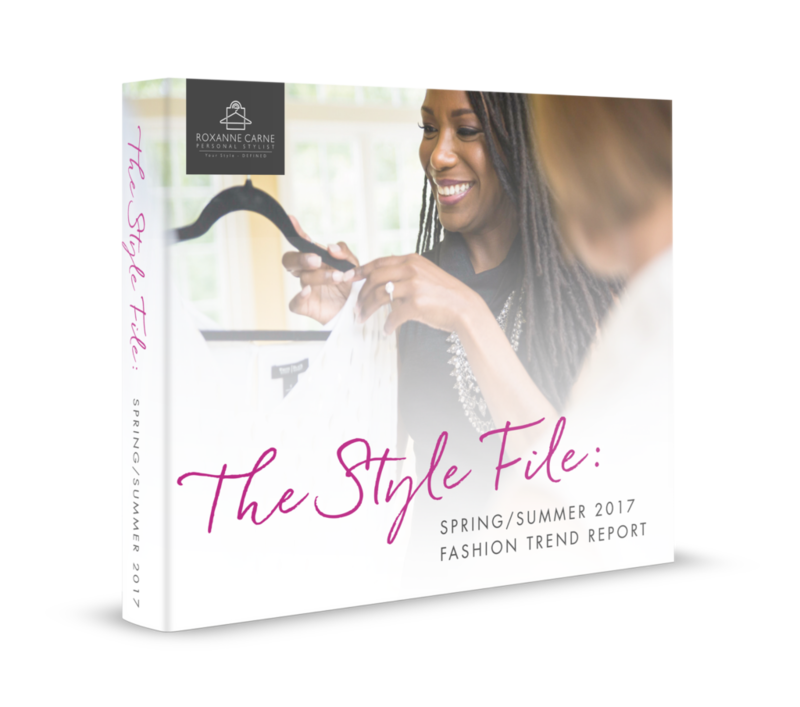 Grab a copy of my FREE Spring/Summer Fashion Trend Report that will walk you through the hottest trends of this season with some recommendations on great pieces you can buy! Share a Pic of Your Updated Closet! I’d love to see a pic of your newly organized closet! When you’re all done, take a pic of your new closet and tag me on Facebook or Instagram. Go on and show off your hard work!